Elizabeth Warren came out swinging against a Capitol Hill compromise that she says undermines protections established after the financial crisis. She blasted a change to the government funding bill as "the worst of government for the rich and powerful." Major banks lobbied for the provision, which "would let derivatives traders on Wall Street gamble with taxpayer money and get bailed out by the government when their risky bets threaten to blow up our financial system," she said. "This provision is all about goosing the profits of the big banks," she said. "People are frustrated with Congress. ... If big companies can deploy their armies of lawyers and lobbyists to get the Congress to vote for special deals that will benefit themselves, then we will simply confirm the view of the American people that the system is rigged." The original Dodd-Frank financial regulation included a restriction on "swaps." Those are a type of transaction where traders sell loans. Swaps were used to sell risky loans and ultimately led to the global economic collapse of 2008. 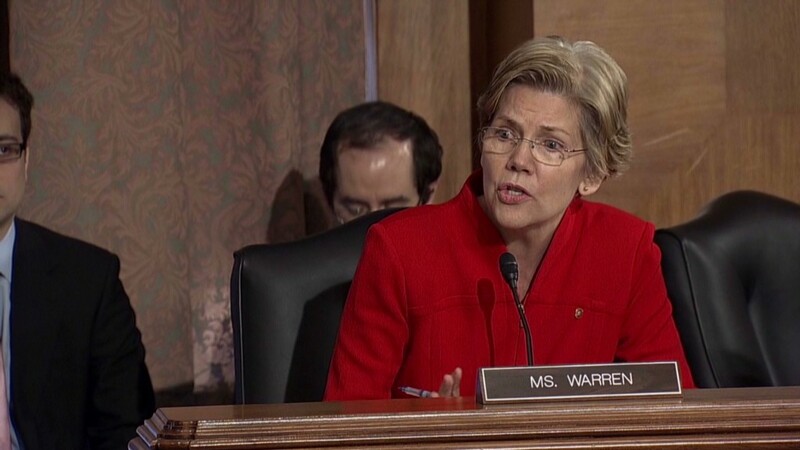 The law blocked those loans from being federally insured -- or, as Warren said in a passionate speech on the Senate floor, it "prevents future government bailouts" when the bad loans sour. The restriction would be eliminated if the funding bill is enacted. Lawmakers arrived at the compromise late Tuesday in order to fund the government by Thursday and prevent another shutdown. Their back-room negotiations produced a string of attachments -- known as "riders" -- unrelated to funding the government, like measures on school lunches, marijuana and the "swaps" rule change. In exchange for ending "swaps" restriction, lawmakers boosted the budgets of two Wall Street regulators, the Securities and Exchange Commission and Commodity Futures Trading Commission. Warren said it's a bad compromise.